Jurgen Klopp's side were in control of the game for most of the first half but their failure in finishing off moves meant they have now won just once in eight games. Liverpool continued their offensive tactics after the half-time but Emre Can wasted their best chance by volleying over the bar from eight yards after being picked out by the impressive Joe Gomez. The point leaves Jose Mourinho's side with nine clean sheets in their last 10 league games - two points behind derby rivals Manchester City, who thrashed Stoke 7-2. On the other hand, Liverpool have now won just once in eight matches, but this was a brighter showing on a highly competitive game at the Merseyside. Wilfried Zaha's winner helped Crystal Palace stun defending champions Chelsea to register their first victory of the Premier League season after losing all seven of their previous games. Palace put an end to their goalless campaign when Yohan Cabaye forced the ball down off his chest, which bounced off David Luiz and into the back of the net off Chelsea defender Cesar Azpilicueta in the 11th minute of the game. However, their lead only lasted for eight minutes as Chelsea forward Cesc Fabregas' corner was headed in by Tiemoue Bakayoko. Zaha's first goal of the season acted as a catalyst for the Palace side and Chelsea failed to draw level after that, gifting the match to Palace. Per Mertesacker began his first Premier League start in 532 days in a stunning fashion scoring the opening goal, by converting Granit Xhaka's corner in the 39th minute, to put Arsene Wenger's side on course for a fifth successive win in all competitions. However, Watford, who had scored late goals to pick up points away at Swansea City and West Brom in their last two outings, demonstrated their new-found resilience under manager Silva, with a 71st-minute equaliser from the penalty spot by substitute Troy Deeney. 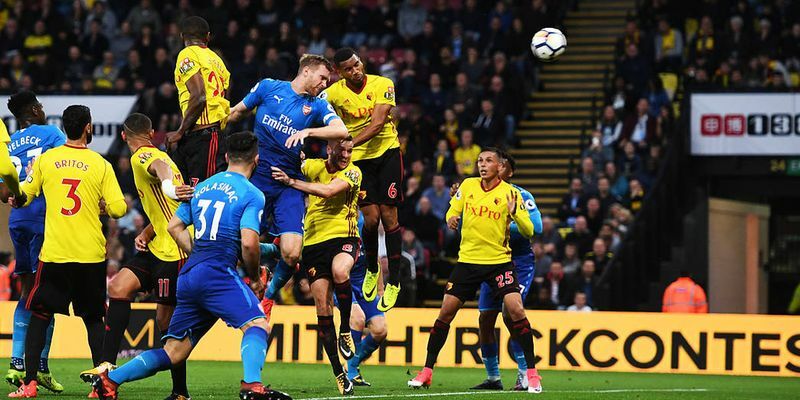 While the game seemed to be meandering towards a stalemate, Tom Cleverley popped up with an injury-time winner that sent Watford above Arsenal and up to the fourth spot in the points table.